I grew up on Sci-Fi of all kinds, but it was more science-fiction fantasy. Flipping through Netflix I found a few things I wanted to watch that I thought you might be interested in. The first is Tin Man. It is described as a reimagining of The Wizard of OZ, known as “The O.Z.” or the “Outer Zone” I spent the first 1 ½ episodes trying to sort out if it was a retelling, if it was inspired by, or if it was a “return” to Oz. As it turns out it’s sort of like the distant future of the original story. The yellow brick road is old and worn brick road. Our Dorothy, D.G. is a waitress who at the beginning of the series is wearing a blue and white checkered apron similar to the dress Judy Garland wore in the original. There are lots of familiar things like the lollipop guild you meet early on who identify themselves as the resistance fighters of the eastern guild and the flying monkeys are still evil but they are called mobats and look like they could be real live creatures (bat/monkey combination) on an undiscovered island somewhere. In this story, D.G. is raised without any memory of the O.Z. and she starts to have dreams that lead her to the Outer Zone. Instead of a wicked witch there is an evil sorceress with plans to use the emerald and the double eclipse to leave the O. Z. in darkness and D.G. is the only one who can stop it. She meets up with the scarecrow, a “head-case” who lost his brain to the sorceress. 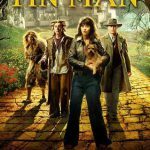 The tin man has a trauma-filled back story and as a result has no heart. The lion that’s more humanoid kind of beast used by the sorceress to read minds and see into the future, still scared but not as hokey as the original cowardly lion. You don’t get to meet Toto right away, but he plays his part. D.G. has to find her parents, learn the truth about her past, find the “wizard”, find her parents (yes again), find the emerald, save the princess and the entire O.Z. If you are looking for the song and dance you’ll be disappointed. There is plenty of action, some magic, and of course a tornado. Reflecting on this one, it made me want to watch the original again, and Return to Oz. I haven’t seen them in decades, but I just want to compare. 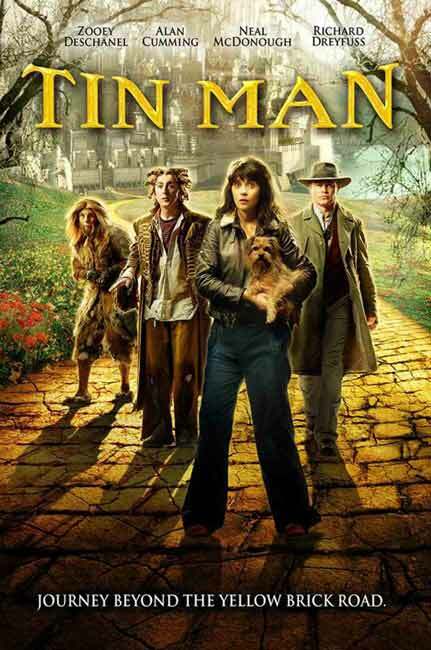 You know how some movies have a “moral of the story”, a lesson to learn, Tin Man is one of those stories and I feel like the original and Return to Oz were too but I don’t remember and I’m curious to know how similar those lessons are. If you do check it out drop me a note. If you might be interested in a podcast discussing Tin Man, The Wizard of Oz, Return to Oz, and any other incarnations of Oz let me know. I’ll watch them again and find someone interesting to talk to about them. This is one of my favorite retelling/reimaginings of “The Wizard of Oz.” I own it on DVD. I need to rewatch it myself soon. Love seeing you do some blog posts Lizz! I hope I get to see more of you blogging.